Now you can update your facebook status with animated picture by just following these steps. Certain things are to be required before applying this trick. Posting animated pictures on groups and timeline require an Application. So, it is a must that an access token is required. I will explain you in simple steps to post animated or GIF images on your Facebook timeline or groups. The method to create an application is simple than you expect. Just visit Facebook App Developer site and press Create a New App. Enter the name of the application and hit Continue button. Now drive yourself to Facebook Graph API Explorer page and the selected new application is to be chosen. Select the application using the Application drop down box which will be available at top right corner of the page. After selecting the application, just click on the Get Access token button. Now, select the choices as shown in the below picture. the ajax dialog box will have 3 tabs. In the User Data Permissions tab, select publish_actions. 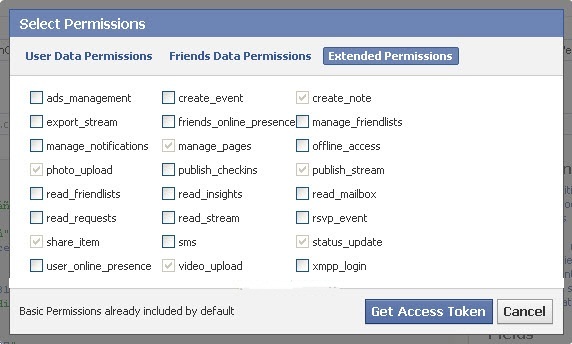 In the Extended Permissions tab, you need to select multiple choices. Follow the image below. Select all item which I have selected above and press Get Access Token button. You will be asked to authorize the application. Just Allow the application. Now click on Submit button which will be available below Get Access token button. Now, this step is not yet completed. Click on the accounts link which will be available below the Connections. 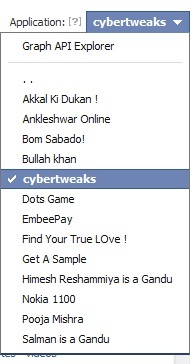 By clicking them, it will display your page’s access token. See a sample below and note the access code which you generated. Copy them and paste it in a notepad for easy and future use. To post as a page, you require an access token of a page and not yours. PAGE_ID is the ID of your page where you want to post. You can use the username too here. CUSTOM_MESSAGE will be the message to be posted when you publish the animated picture. PICTURE_ID is the value of fbid of the picture which you uploaded to your page. CUSTOM_CAPTION can be any cation you like for the animated image you try to post. CUSTOM_DESCRIPTION can be any text to describe the picture you post. ACCESS_TOKEN is the one which identifies your application. The one which you generated in the step 2 should be used here. first check your error message you have entered invalid fbid.